Mathew Ryan's last-minute penalty save helped earn Brighton a 1-1 draw at Stoke this afternoon. Here's six things we learned from the game. Mathew Ryan has proved his worth time and time again this season and ensured Albion returned home with a valuable point today. Seagulls' supporters were singing the Australian number one's name long after he went down the tunnel after a spectacular last-minute penalty save. There were arguments between Stoke players as to who would take the late spot-kick but substitute Charlie Adam got the nod. His penalty was pushed out by Ryan and Lewis Dunk then produced a superb tackle to stop Adam scoring the rebound. That was not the end of the drama, though, as Ryan had to keep out Adam's low corner and then Mame Diouf's header was cleared off the line by Anthony Knockaert in injury-time. Columbian winger Jose Izquierdo is fast getting a reputation as someone who doesn't score ordinary goals. Three of his four goals for the Seagulls have now been stunners - two were strikes from distance and today came from an outstanding team move. Izquierdo netted from distance against West Ham both at home and away and today scored against Stoke for the second time this season, after scoring from six yards in the 2-2 draw in November. Today was an outstanding team move as March played the ball out wide to Izquierdo, who came inside and played one-twos with both March and Dale Stephens before firing past Jack Butland from ten yards. It was a superb goal and Albion will hope Izquierdo can continue his rich vein of form in the coming weeks. A record crowd of 29,876 was at the bet365 Stadium for the crucial showdown at the bottom of the Premier League. The Potters have been in the top flight for ten seasons but sit third from bottom this season as it's a real dog fight to stay in England's top tier. Paul Lambert took over as their new manager last month and won his opening game 2-0 against Huddersfield and they have now taken two more points from the following three games. The previous record crowd at the stadium had been set only last month when Lambert took charge of his first match against the Terriers. Despite that, there were still a few empty seats so the record is likely to be topped again before the season is out. Stoke striker Saido Berahino's wait for a goal is now up to 714 days after he failed to score in his 45 minutes against the Seagulls. The 24-year-old joined the Potters from Stoke for £12m last January but has failed to score in 27 games since signing. He has missed three penalties since he last scored, so it was little surprise he didn't take the late spot-kick. His luck in front of goal was summed up ten minutes from time when he slipped and sliced the ball well wide of the target. There were mixed feelings from an Albion perspective after the game. After playing so well for long periods and having chances to add to Jose Izquierdo's goal, there was slight disappointment the Seagulls did not get more than a point. But after conceding a penalty in the last minute with the score 1-1, there's little doubt Albion will be happy with a point. Before the game, it was probably more must-win for Stoke than it was Albion as the Potters remain three points behind Brighton with an inferior goal difference. Like the draw at Southampton, this will become a very good point if Brighton back it up with victory over Swansea in their next league game at the end of the month. The strongest subs bench in Albion's history? Have Albion ever had a subs bench as strong as the one at the bet365 Stadium this afternoon? 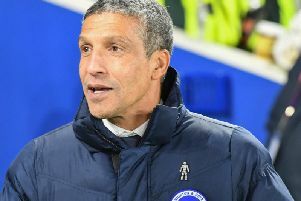 Obviously, clubs now have seven players on the bench as opposed to one, three or five in the past but there were a host of options for Seagulls boss Chris Hughton to choose from. That competition for places can only be a good thing as Brighton head into the crunch final three months of the season. Back-up keeper Tim Krul has eight caps for the Netherlands and he was on the bench with club captain Bruno and Beram Kayal, who has 30 caps for Israel. Anthony Knockaert, the Championship - and Albion's - player of the year last season, was also a substitute, alongside club record signing Jurgen Locadia, fans' favourite Leonardo Ulloa and Connor Goldson. That meant the likes of Tomer Hemed, Sam Baldock, Uwe Hunemeier, Liam Rosenior and Markus Suttner could not even get a place in the 18-man squad.